The term "Baroque" originally referred to an impure pearl, a slightly deformed pearl - Baroque art deals with imperfection, with mortality and vanity, with nature, Antique and Christian religion and with the contrasts between beauty and ugliness. It refers to an era in the 17th and 18th century, a time dominated by new scientific insights, discoveries in foreign countries, religious wars and a strong culture in celebrating and showing off wealth - at least as far as it concerns nobility and clergy. In Austria, the Baroque kicked in through the counter-reformation, when the Habsburgs worked hard on getting rid of all Protestant influence in the lands they ruled. The Emperors Leopold I, Joseph I and Karl VI were responsible for the establishment of Baroque culture at the Imperial Court, all three of them were strong supporters of fine arts and music. However, the Austrian contribution to Baroque is most obvious in architecture. The majority of the artists that helped shaping the country in this particular style were Italians: Solari, Zucchanelli. Martinelli, Carlones - German names like Johann Bernhard Fischer von Erlach and Lukas von Hildebrandt (born in Genoa) are rather rare exceptions. Austria′s most western province Vorarlberg developed its own distinct style and influenced much of today′s Switzerland and Swabia. Noteworthy artists there included the builder families of Beer, Kuen, Thumb and Moosbrugger. The big boom of Baroque splendour followed the end of the Second Turkish Siege of Vienna in 1683. The enormous Turkish army had devastated many towns and looted essentially every church, monastery and palace in Eastern and Southern Austria. With the conquest of enormous new territories that had previously been under Turkish rule, the Habsburgs underlined their status as a superpower and started to rebuild the country in the most opulent manner. Rivals to the French King Louis XIV, they bred enormous palaces in and around Vienna: Schloss Schönbrunn, Schloss Belvedere and Schlosshof to name only three particularly impressive ones. Fischer von Erlach and von Hildebrandt were the figureheads of the "high Baroque period", when finally a few more Austrian artists joined the creative folks from south of the Alps: Josef Prandtauer designed Melk Abbey; Mungenast and Prunner were also specialists for sacral architecture. All over the country, monasteries were either renovated or rebuilt from scratch and the seriously rich Prince Archbishops of Salzburg continued to build more churches and castles - which they had started with in the early 17th century, a time when the Emperor in Vienna was still threatened by Turks and Protestants. In fine arts, Austria′s local heroes include the Bavarian-born Johann Michael Rottmayr, a great painter of monumental frescoes and altar paintings. 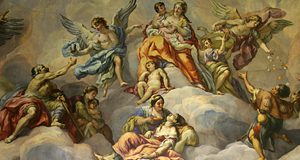 His most important piece of work are probably the frescoes in the central cupola of the Karlskirche in Vienna. Sculptors like Donner, the Schwanthaler family from Ried and others achieved outstanding results in marble, wood and ivory. Examples can be found in the Kunsthistorisches Museum, the Österreichische Galerie Belvedere, the Liechtenstein Museum (which itself is a fine example of late-Baroque architecture leaning towards Classicism) and the many churches and palaces all over the country. Over-all, paintings by Flemish and Italian artists were a bigger deal, though, and German names are exceptions in the galleries of the Kunsthistorisches. In the second half of the 18th century, under the rules of Empress Maria Theresia and later her son Joseph II, Baroque style was gradually developed on to Rococo, Classicism and later various strands of Historism (such as Biedermeier, similar to British Regency or Empire styles). Nonetheless, the period of Baroque had shaped the country like no other before. Only the Gründerzeit between 1848 and 1914 can be compared to Baroque in terms of visibility in Austria. Be it monasteries, churches, parks, palaces or burgher houses - Baroque culture was tremendously important for Austria′s history. If you are interested in this period, see my suggestions for "Touring Austria′s Baroque Heritage".